WHY WOULD YOU WANT TO ADD OTHER FOOD STUFFS TO YOUR DOG’S DIET? Your dog is underweight or does not seem to be able to put on weight on its current diet. You would like to provide your dog with a broader selection of food stuffs to aid variety to its diet for the health benefits and to provide some variety for your dogs meals. off their favorite meal of the day! - Diabetes; Thyroid problems; cancer etc. If you are sure that none of these (or similar conditions) are present then your dog is healthy but simply not getting enough of high quality digestible nutrition on a daily basis. If you are going to go to the bother of introducing fresh food stuffs to your dog’s diet, you should also make sure that your are feeding your dog a good quality kibble. It is important to understand that just because a dog food product is readily available and sold by pet stores is not an indicator that it is a good product. The cost of the product is also not a conclusive indicator of the quality of the product. In the last decade the percentage of grain products used in kibble has increased dramatically. Many of these grain products are added primarily as fillers - for the benefit of the manufacture’s cost margin and profit, not for the benefit of your dog. The digestibility of many grain products is negligible. Your dog ends up consuming a lot of filler with very little nutrient value. This is very deceptive as you think you are feeding your dog enough and his stools are sizable (due to the high filler indigestible fiber content), but his nutrient intake is low. Look at the ingredients list on the kibble. If ground corn, ground yellow corn, chicken by-product meal, and corn gluten meal, ground wheat appears near the top of the ingredient list - change your dog’s kibble! You may also see soy and peanut hulls - also not a great source of nutrients. If they appear in the ingredient list but lower done I would advise that you still change to a better product. Many dogs develop allergies to these ingredients and then must go on a grain-free diet. 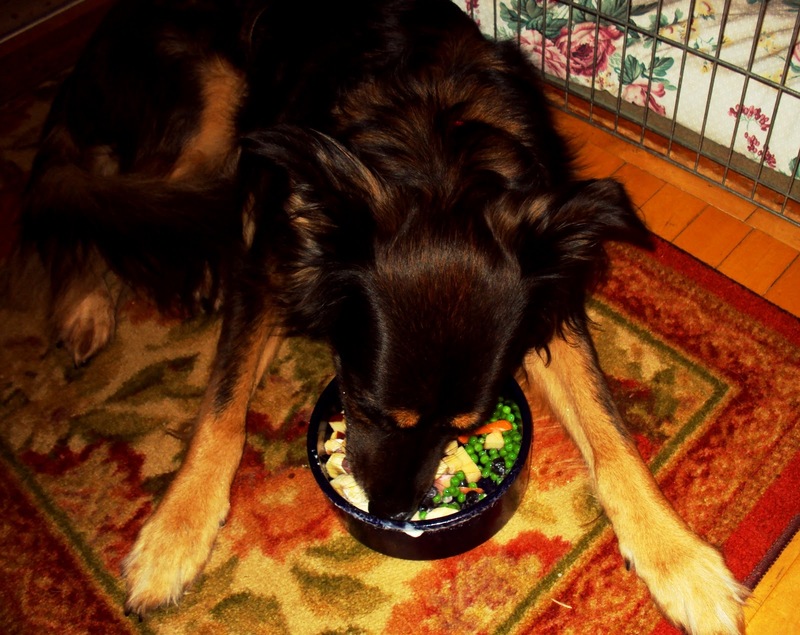 Rice offers better nutritional digestibility…although some dogs are allergic to rice as well. Potatoes provide fewer nutrients than rice does. Sweet potatoes are a good alternative to rice. Protein should be the first ingredient in your dogs kibble…but there are issues to be aware of with protein sources too. Protein may come from poultry (chicken, duck, etc. ), cattle, swine, lamb…the problem is often what goes into the kibble is not the quality cuts of meat - lean muscle tissue. Instead the animal parts that are added to a lot of kibble is the by-products - the bones, blood, intestines, ligaments, and many other parts not sold for human consumption. Make sure that the manufacturer states right on the bag that the protein source is of first grade quality. Animal and poultry fat is added to a lot of kibble. Again these are the rancid fats and oil by products that are not sold for human consumption. Waste from restaurants and food manufacturing is saved and then refined by rendering companies, who then turn around and sell it to pet food manufactures. The manufactures add them to their poor quality kibble to give it taste and to help the ingredients bind together. If this ingredient appears in the first few ingredients - switch to another kibble…again if it appears at all in the ingredients list, you should consider getting a better kibble. And lastly synthetic additives and preservatives are no better for your dog than they are for you. They are added to the kibble to help stabilize the product and enhance its appearance. The most common of these preservatives are BHA, BHT, and EQ…they are known cancer causing (carcinogenic) agents. Look for products that use ‘natural preservatives’ and antioxidants such as Vitamin C, Vitamin E. Mixed tocopherols are better than BHA, BHT and EQ but vitamen C and E are better. Please make sure that artificial food coloring is not present in food and treats! If you would like to see a more comprehensive list of carcinogens found in many dog foods you can click here. So, now that you know a little more about the ingredients in dog kibble you may see why your dog could have difficulty either putting on enough weight or have trouble losing weight! Don’t switch his food overnight. Add a little of the new food to the old food. Gradually increase the amount of new food and decrees the amount of old food until the old is completely replaces by new. This process should be carried out over several days to several weeks depending on the hardiness of your dog’s digestive system. Some dogs are very sensitive to changes in their diet while others dogs are not. I cheat on this rule as all of my ten dogs have good tolerance for food changes; if I want to try a new kibble I can do so as an immediate switch. If you have switched your dog’s food before with no deleterious affects and you know your dog’s system is hardy you can shorten the phasing in of the new food. TRULY GOOD QUALITY DOG KIBBLE COSTS YOU LESS MONEY! If you are feeding your dog a good quality kibble you need to feed your dog substantially less kibble than if you are using a poor quality kibble! Your dog’s feces will also be smaller. Preventive maintenance - your dog is eating healthier food - his bones, muscles, fur, skin will be healthier as will his immune system, vision and so on. He will also be less prone to developing food allergies. Healthier system means less vet bills! OK so now we can talk about adding fresh food to your dog’s diet! Some people like to remove kibble completely from their dog’s diet and go to a completely fresh food diet. I like to mix the two. My guys get kibble in the morning and early evening and then, later in the evening they get their bowl of fresh food. A good selection of fresh food offers dog’s the same beneficial advantages that it offers us humans. High quality nutrients, antioxidants, high quality protein, omega fatty acids for heart, skin, fur and so on. Highly digestible nutrition can help them put on weight and if the dog is overweight, can also help the dog to lose weight. Salads aren't for every canine - if your dog has a very sensitive stomach, it may not be a good idea to introduce fruits and veggies to their diet! At least not more than one at a time. 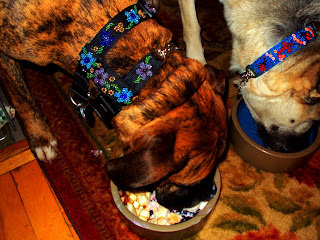 My own dog pack and foster dogs have never had sensitive stomach issues so they do well on a mixed diet. If you are going to introduce fresh or cooked fruits and veggies to your dog's diet it is best to introduce each new food one at a time - that way if their is any kind of negative reaction, such as stomach upset or allergies you will be able to pinpoint the culprit. None of my pack members have any allergies to fruits and veggies with the exception of Robbie my Boxer. The ingredients may vary slightly depending on the season - for instance watermelon and cauliflower in the summer and oranges and peas in the winter. The following represents a pretty typical list of my dogs' daily fare for fruits & vegetables: peas, carrots, apples, blueberries, bananas, watermelon, tomatoes, ground flax seed, fresh chopped garlic, plain yogurt, mackerel and a little olive or canola oil. During allergy season (late summer, early fall) I also aid a couple of tablespoons of 100% Aloe Vera juice. Aloe is great for the immune system and I have found it has greatly reduced Robbie's discomfort during environmental allergy season. Robbie is allergic to peas so he has oranges, tomatoes or carrots instead. One day Robbie started scratching more than he would usually. By the process of elimination I was able to pin-point the cause of his discomfort. I knew the scratching was not a result of an infestation of fleas. My next line of thought turned to the possibility that he was experiencing an allergic reaction to something. I thought about whether he had been exposed to anything different in the last few days - either environmental or ingested. There was nothing new environmentally that I knew of so I focused on food. I quickly realized I had recently introduced peas to his salad. I removed the peas from his menu and the itching stopped. He is also allergic to sweet peppers (all colours), I discovered this when I substituted peas for peppers. 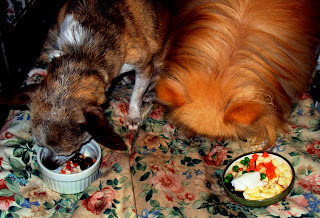 Other typical ingredients for my dogs' salads are: pineapple (canned in juice or fresh), blackberries, raspberries, strawberries, oranges, pears, mangoes, papaya, sweet peppers, broccoli in small amounts and infrequently (there is some thought that too much broccoli can cause issues with internal organs), cauliflower, eggs, cheese, chopped garlic. Sweet potatoes are a great addition too. I add a good quality vegetable oil such as olive oil. I would suggest avoiding corn, canola and soybean oil as canola and soy are genetically modified (GM) products. The oil provides them with good omega fats. 1/2 tablespoon for the really little guys like my 4 lb Pomeranian and my 8 lb Chihuahua, 1 tablespoon for my dogs who weigh 15lbs to 30lbs and 2 tablespoon for all my larger dogs 30 lbs to 70 lbs. I also include a fatty fish such as canned salmon, mackerel or sardines; these are rich in protein and omega fats and ground flax seed - also a great source of omega fatty acids. The last ingredient in their salads is plain yogurt (usually 2% fat) for the protein and good bacteria it adds to their diet. It is interesting to note that the pet food industry recently added the active ingredients in yogurt to dry kibble products. I also add herbs and spices to my dogs' salads. Herbs and spices have many beneficial health properties that help support a healthy immune system, fight ailments, disease and cancer and are rich in essential vitamins, nutrients and antioxidants. You can find out more about adding herbs and spices to your dog's diet in this article, Herbs and Spices for Your Dog's Health. My dogs also get a treat of rawhide with natural peanut butter on top. Peanuts and peanut butter are good for dogs as long as you are providing them with 'human grade' peanut products. Non-human grade nut products (as well as grain products) are not regulated for alfaltoxins (a fungus growth) that is known to be carcinogenic. If you would like to see a more extensive list of healthy whole foods that you can add to your dog's diet and the associated mineral, vitamins and trace elements you can click here. My dogs are so brainwashed into thinking veggies are a treat that they will, should occasion present pilfer from my rabbit’s salads! 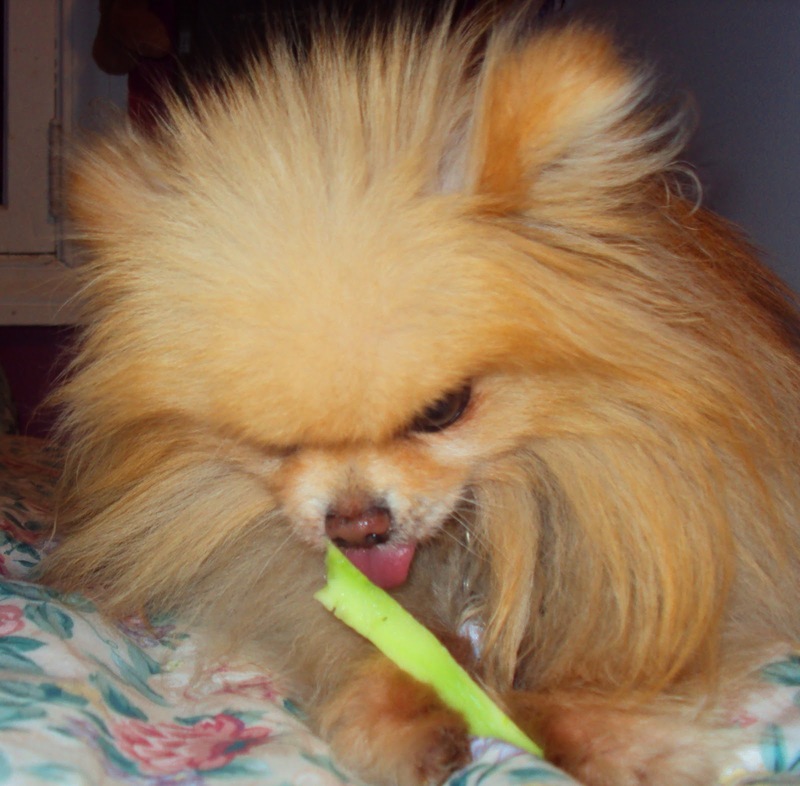 Jacob the 4 lb Pomeranian is the worst culprit as his little paws fit through the rabbits play pens with ease. Nice try Jacob! I caught you! It is important to make sure hard ingredients such as apples, carrots, cauliflower are cut up in small pieces as you would not want your dog to choke on a piece that became lodged in their throat. This happened to Zoey once (my 12 lb Pomeranian); his airway was completely blocked. Zoey quickly became unconscious and if I had not administered the Heimlich manoeuvre and mouth to mouth resuscitation he would have died in front of my eyes. My dogs' veterinarians always comment on the packs' healthy coats, skin etc. - their diet has a big part to play in their overall health. I know of other veterinarians who do not believe in 'mixed' diets. As our companion dogs don't get to decide what their diet should comprise of, their human guardians must make the choice for them based on the knowledge at hand and on any mitigating factors such as the individual dog's tolerance to various foodstuffs. If you would like to see an extensive list of foods that your dog should never eat you can click here. This was great, thank you! Do you have any suggestions on how I can calculate how much of each kinds of food my dog(s) should be eating so that they're getting everything they need as far as protein, fat, etc etc?